The Nile is famous as the longest river in the world. The river got its name from the Greek word Neilos, which means valley. The Nile floods the lands in Egypt, leaving behind black sediment. 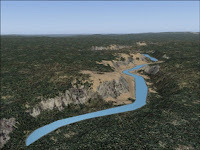 That's why the ancient Egyptians named the river Ar, meaning black and "Rivers of Life". The River Nile is about 6,670 km (4,160 miles) in length and is the longest river in Africa and in the world. Although it is generally associated with Egypt, only 22% of the Nile’s course runs through that country. It was by the banks that one of the oldest civilizations in the world began. The ancient Egyptians lived and farmed along the Nile, using the soil to produce food for themselves and their animals. The Nile and its tributaries flow through 10 distinct African nations: Ethiopia, Sudan, Egypt, Uganda, Democratic Republic of Congo (formerly Zaire), Kenya, Tanzania, Rwanda, Eritrea and Burundi. The vast river system of the Nile includes two main tributaries: the White Nile (so named for its milky, silt-filled appearance), and the Blue Nile, which joins the White Nile in Sudan on its way to the sea. The source of the White Nile is the springs of Mount Bigugu in Rwanda. The source of the Blue Nile is Sakala Springs above Lake Tana in Ethiopia, which contributes to more than 50 percent of the river’s flow. The water’s volume from the Blue Nile increases tremendously in the monsoon season, from July to September. The ancient Egyptians worshiped the Nile as one of their gods (the god Hapi) and made sacrifices solely for the Nile’s sake. The first dams were built on the Nile in 1861 in order to raise the river levels for easier navigation and increased irrigation. Major dams on the Nile today include Aswan Dam, Roseries Dam, Sennar Dam and Owen Falls Dam. Today the Nile remains a vital pathway that is essential to millions of African farmers. Egypt still imports 40 percent of its grain by means of the Nile. The entire Nile River Delta is estimated to drain an area of 1,293,000 square miles. This area is so vast that is has a number of different climate areas. North, in Egypt and Sudan, rainfall is sparse. More to the south, in and around Ethiopia, rainfall is heavy, contributing to the floodwaters that rush downstream and eventually create the wonderfully fertile soil that supports so much of life in Egypt and Sudan. Dams, the most notable being the Aswan High Dam, have been built along the route to prevent massive flooding of populated areas. The Nile River Delta is home to many species of animals, including crocodiles, turtles, baboons, wildebeest, and more than 300 species of birds, including fishing eagles, ibis, and the Nile Valley Sunbird. The people who lived along the Nile in ancient times used the river for agriculture and transportation. That hasn't changed, although the methods of agriculture and transportation have. Steam ships are still used in Egypt and Sudan, to transport goods. Only 22% of the river passes through Egypt, the other countries through which Nile passes are Sudan, Burundi, Ethiopia, Zaire, Kenya, Uganda, Rwanda and Tanzania. The cities that Nile flows past are Cairo, Khartoum, Gondokoro, Aswan, Karnak, Thebes and the town of Alexandria. The source of the river is debatable since it is commonly known that the source of the river is Lake Victoria, which is the biggest lake in Africa, but it is observed that on the northern side of the lake there is a waterfall called Ripon Falls, which has a small opening and seemingly that is where the water in the River Nile comes from but then this cannot be held as the ultimate truth since there are many rivers that flow into Lake Victoria therefore which one of these or if all of them are the sources of The Nile. Presently River Kagera and its tributary, which is called Ruvubu whose headwaters are in Burundi, are considered to be the source of the River Nile. Nile also played an important in the building if the famous Pyramids since the blocks of stone, which were used to make these pyramids, were actually transported from the source to the site with the help of Nile. Loking through your blog I found an interesting information about Egyption geography. Next time, being in Egypt I'll try to pay attention to ithe Nile River! I am doing a project and this gave me alot of help, Thank you!!! Wow thats incredible, the Nile is shaped like a river, oh wait because it is. But anyway thank you for this incredible information I used it well in my biology home work. I can't believe you actually published this excuse for a website. Absolutely disgraceful. The information is irrelevant, probably incorrect and it all adds up to be a n appalling "resource" for people who actually want to get some work done. dude this was so awesome thx 4 the info i needed it 4 this project im doin so thxthxthxthxthxthxthxthxthxthxthxthx! very helpful and full of facts. there's quick and easy ones to write and quite a few interesting ones. I was looking for a website to do my geography homework on the River Nile and when I found this one I thought it wouldn't have much information but it has loads and I have do 3 pages! Thanks!!! Thanks this helped a lot for my school essay. is it okay if I use some of this info for my school project.